This entry was posted in English and tagged Jonah, map, Old Testament. Bookmark the permalink. i was praying about what book to teach next, and i was thinking about Jonah today and then i see this is the only thing in my GoogleReader – so i’ll take that as a confirmation. thank you sir, for the art! Glad to be of service, Dean! Totally unintentional, Chris. I’ll fix the mistake immediately. Good pickup. Hi Mark, i would think Tarshish should have the B marker and Nineveh should have C, why is it the other way around? Hi Dean. I had a logical rather than chronological sequence in mind, i.e. God commanded Jonah to go from A to B (Nineveh), but Jonah set out for C (Tarshish). Hi Mark, thanks for your great image. My pastor used it to illustrate Jonah’s journey in his two part sermon series on the book of Jonah. I am currently writing about the whole book of Jonah, and would love to use your image for illustration purposes. I intend to produce my own images for other purposes in my production, but I wonder if you would be willing to allow the use of your map image. As of yet I do not intend to charge for the book (I plan to make an eBook), but will keep you in the loop of my plans. I am only a small way into my writing, but if you’d like to check it out, go to http://prophetwhofled.wordpress.com/ Cheers and God bless, Pete. Great image for Jonah’s journey! I am giving a talk to some college students at UNC Chapel Hill on Jonah and would love to use the image as illustration. Would that be alright with you? Feel free to email me about this too. Your map tel the story. may I use in in our service on Sunday? Our associate pastor is teaching on Jonah tonight and wanted to get permission to use your Jonah map as an illustration. We stream our services over the Internet and to our video campuses. We also archive the teachings on our website and sell DVDs at cost to people that want to give out to the service. Please email me and let me know if we have permission. We will give full credit to Mark Barry on the illustration. Planning a sermon series on Jonah so might make use of your image. Cheers. Hey Mark! Love this visual – could I have permission to use it on my site (SheReadsTruth.com) for our Jonah study next week? We would, of course, plan to link to our source! (my email: hello@shereadstruth.com) Thanks! Absolutely, Raechel. I’m glad it’s helpful! Mark, thanks for the great resources. I’m prepping a message on Jonah and looking to use your map in connection with that. God bless! I’d like to use the image in a three part Sunday School lesson on Jonah. I’d also like to send it in an email (with a link to your site) to all the families, so those who can’t make it to church can share in the congregation’s discussion at home. Mark, thank you for your work and this website. 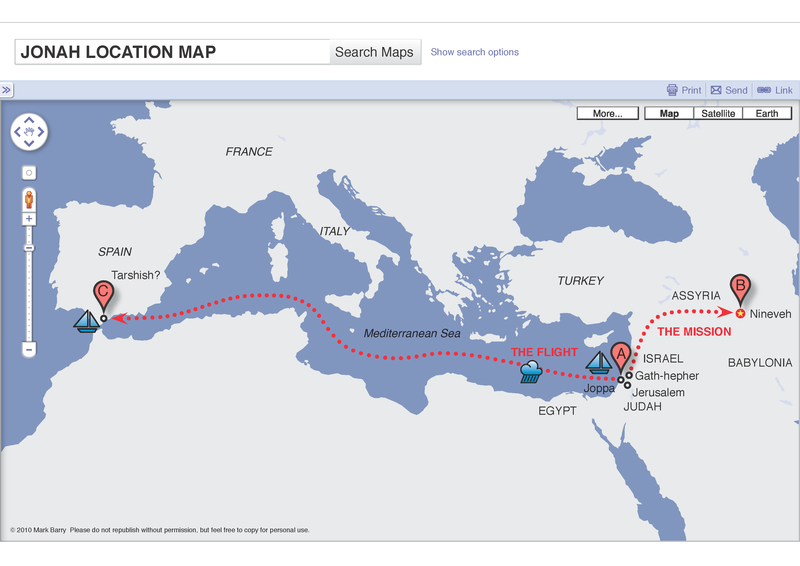 I will be speaking on Jonah at my church and wanted to ask for your authorization to use the Jonah map. Please let me know & thanks again for this work. Hi Lyndon. Yes, feel free to use the map. hello Mark, thank you for your map, it’s a great work! I’m speaking on Jonah ch.1 at my church, so just want to make sure i can use the Jonah map. thank you. Mark, would like to use this for a powerpoint presentation for a sermon series in Jonah. Thanks. Great and Helpful site! Pete, I am speaking on Jonah on Sunday, Is it possible to use your map as an illustration?